It’s not Apple II, IBM PC or ATARI that gave the birth to the personal computer. It was Commodore 64 that did this as it was affordable for the masses. The Commodore 64 got released in 1982 which is so important that it deserves a dedicated article now. This amazing 8-bit computer dominated the market during most of the 1980s. Superior graphics and sound through its SID chip, 64K of RAM, multi-color sprites (ideal for gaming) and low price made the C64 the best selling single computer model of all time, according to the Guinness Book of World Records even. In 1984, the year of the launch of the Macintosh with the famous Super Bowl commercial, was actually the year of the Commodore 64 and not theirs. The 8-bit computer made by Commodore sold over 2.6 million units in 1984, much more than the Apple II and more than the IBM PC home computer competitors. It simply killed all other competition. The C64 continued selling between 1.3 and 1.6 million a year for the rest of the 1980s, reaching an estimated total of 12.4 million units worldwide. The truth is that the Commodore 64 was the only force able to stop and delay the rise of the IBM PC which at the time haven’t started to license its technology to Compaq etc. 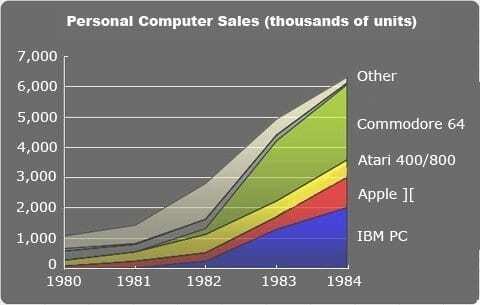 As we know, IBM PC ended up dominating the world. But in the start of 1980s, both Vic-20 and then C64 was still selling well during the 1980s. So, it’s nice to conclude that everything Apple is telling about how well they did in 1980s is not true. What most of the sources told us is that Wozniak and Jobs invented the personal computer (the Apple I) in the famous garage. Then Mike Markkula funded them and Apple Computers was born. This made it possible for the two friends to create the Apple II, an amazing computer that dominated the ’80s, making Apple rich and ultimately allowing Jobs to create the Macintosh. In people’s mind, 1984 was the year of Apple, marked by the famous Super Bowl television commercial directed by Ridley Scott. Did it go exactly like this? For sure this is not how I remember the ’80s. My parents bought me my first computer in 1983 and it was not an Apple II, it was a Commodore Vic-20. I saw several commercials on TV and printed ads promoting the Vic-20 at the time. In the newsstands, there were plenty of magazines dedicated to computers, and the majority of them had programming codes or cassettes for the Vic-20, and later, the Commodore 64. Other common (but less popular) brands were Sinclair Spectrum, Texas Instrument, Oric, SEGA. Most of people in the 1980s that had a home computer didn’t have expensive Apple home computer for sure. It was Commodore that pushed C0mmodore Vic-20 and Commodore 64 on people with their adverts everywhere. This was the home computer that was affordable. It beat all in 1984! Apple II was almost just a myth. Yes, it did introduce color gaming for people and it is Apple’s best gaming home computer ever made (except for the fatal Pippin console!). Commodore managed to release several 8-bit home computers. Commodore Vic-20, Commodore 16, Commdore Plus/4, Commodore 64, Commodore 128 and even the portable Commodore SX-64. With BASIC as the main operating system, this home computer gave people BASIC knowledge and at the same time fun. There was also several office applications for it and GEOS was released for the Commodore 64 and Commodore 128 8-bit home computers in 1986, which is 31 years ago today. Unlike many pieces of proprietary software for the C64 and C128, GEOS operating system did take full advantage of many of the add-ons and improvements available. Commodore’s 1351 mouse is supported by GEOS, as are its various RAM expansion units. GEOS 128 also fully supports the C128’s 640×200 high-resolution VDC display mode through a compatible RGB monitor. GEOS might even have become a world leading operating system if Commodore 128D or even Commodore 65 got a real boost. But at this time the Amiga took over the Commodore 64 role. Especially in 1987, when Amiga 500 got released. So, next time you watch a computer history documentary and don’t see any Commodore products mentioned. They should. Because, Commodore 64 is the best selling home computer of all time.